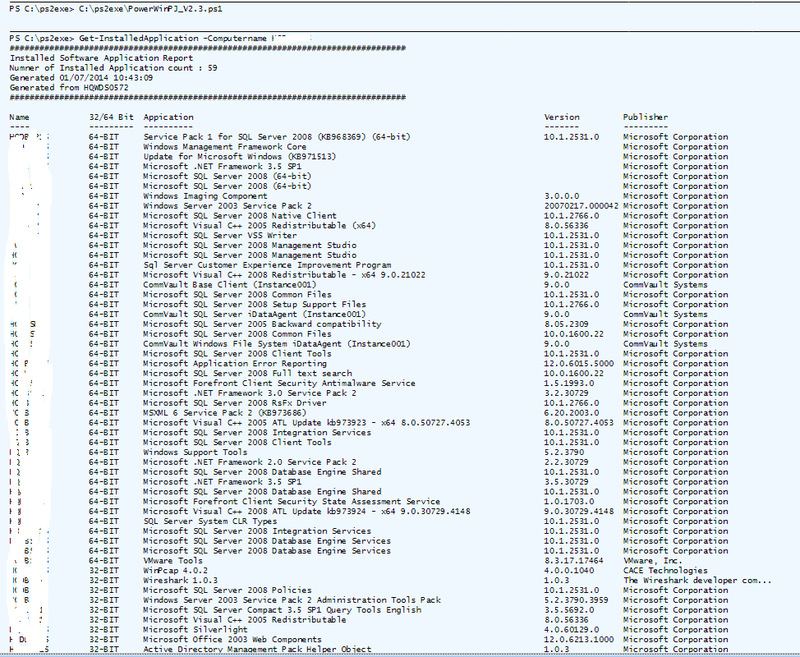 This Powershell script list all the installed application on both 32 and 64 bit applications, particularly useful for people managing both 32-bit and 64-bit applications. This code also contains an exclusion array where you can exclude list of program that you don’t want to show. Function call:- The computer name is mandatory to retrive the software list. $Query = Get-WmiObject -ComputerName $Computername -query "Select AddressWidth, DataWidth,Architecture from Win32_Processor"
"Numner of Installed Application count : $($object.count)"
This entry was posted in PowerShell and tagged 32 bit and 64 bit, application listing, program listing, win32_processor. Bookmark the permalink. This is exactly what I’m looking for, thank you so much! I can’t believe no one has thought to do this until now. How difficult would it be to read multiple computer names from a text file and compile into a single list? Thanks for reading my space. The request will not much time. How do you want to have the output? Text file? It was simple enough to use get-childitem for a text file and call the script for each individual server. Oh one small item, I did notice that when scanning 32-bit machines, the script doesn’t check against the $excludeArray! But that was easy to fix. Also you might replacing the variable appication with application. I love this script, made my job so much easier. It belongs here: http://gallery.technet.microsoft.com/scriptcenter as well! Ooops, I meant to say Get-Content, not Get-ChildItem. Fantastic script! Is there a way to output this as a CSV instead of GridView? Thanks! You can refer my other post where i wrote data to csv file. Good job you have done. It can help beginners with some ready-to-use code. (1) What is it with code duplication (actually, triplication) and the ginormous switch statement? Isn’t it against any code guideline and good practice? (3) would almost the same (minus architecture and excluding by arbitrary selected list) be done by the below one-liner? I really appreciate the time you took to describe the flaws or bad practices that needs to be overcome while writing the code. I’ll try to incorporate your advise going forward. Much appreciate. Thanks for reading and sharing your knowledge. Man this script is a BLESSING!!! Thank you so much. New to powershell. Can you suggest some books / tools to get more advanced. Thank you!!!! can you tell me how to use the script? When trying to run it, nothing happens. No error messages, and only the command prompt clears. I think you have created the function but you are not calling the function. Let me know the steps, if you doing anything different. thank you for your answer. I did exactly as you advised and got the result – a huge table of the installed software. After that, another question came. May I somehow filter unwanted results (in my case anything which contains “Update for Microsoft Office” and “Update for Microsoft Visio”)? I tried to add these strings under $excludeArray in the beginning of the script, but that didn’t work: all the updates are still shown. I think the name is not right. Can you try to give correct application name? I copied and pasted the name. I don’t think it might be incorrect in this case. According to the logic for validation it should begin with these words but may not be the full name, which is variable (it shows KB# after each update). I tried to leave only word “Update” but it still shows all output nevertheless. Can you send me a screen shot to powershellsql@gmail.com? I will take a look at it? thank you so much for your time. My PowerShell knowledge is quite limited, this was the reason for such behavior. Obviously I missed very simple thing which is probably apparent for anyone more experienced. I accidentally closed my PowerShell window and after reopening it and doing Import-Module again, my changes came into force and the script now filters things which I have added in it. Did you recompile the function after adding the application to an exclude list of a function? I’m glad that you figured it out and its serving your purpose. How can you change the sorting? I want first collumn to be architecture – application – version – publisher and remove servername. Hello Pau, Data formatting is not supported in Data grid view. You can drag and place it as per your requirement. Did you see there is an output to the console. I manage to do it Prashant. But I’m having an issue. Our environnent only have 64OS. So when I’m doing the query. It’s showing every application in double which doesn’t reflect whats installed on the computer.